Japanese-American activists who are visiting a World War II-era incarceration camp in Texas on March 30 will join a nonviolent protest of the separation of families and children seeking asylum in the United States with origami paper cranes, or tsuru. Members of the Crystal City Pilgrimage Committee are scheduled to tour the former site of the Crystal City Family Internment Camp in Texas. The camp held as many as 4,000 people of Japanese, German and Italian descent during WWII, according to the National Park Service. After a memorial ceremony, the visiting activists plan to join the protest at the South Texas Family Residential Center in Dilley. The center was opened in 2014 and is designed to hold as many as 2,400 women and children working their way through the immigration system. Both the former camp and the immigration center are located just outside of San Antonio. Protesters plan to place chains of origami cranes in Dilley that have been folded by people around the country and around the world. Formal crane-folding parties were organized in cities including Sacramento, California; San Francisco, Seattle and Los Angeles. According to Mike Ishii, Crystal City Pilgrimage Committee member and New York Day of Remembrance Committee member, the global aspect of the cranes will connect the Japanese children in Hiroshima and Nagasaki -- who were hit by atomic bombs during WWII -- with the Japanese-American families incarcerated in concentration camps and with the asylum-seekers today who are being separated from their families. The cranes will later travel to other national protests, gatherings and confinement sites, Ishii added. Ishii said that the visiting group of about 70 participants will include Crystal City camp survivors and Japanese Americans who plan to travel across the country to participate. He added that the protest, which is being organized locally by the nonprofit organization Grassroots Leadership, will bring together representatives of Latinx, Muslim-American, and Asian-American communities. "We are proud to stand with the families who survived the shameful chapter of incarceration at Crystal City just as we are proud to stand with the families who are fighting for their freedom in family detention camps today,” Bob Libal, executive director of Grassroots Leadership, said. 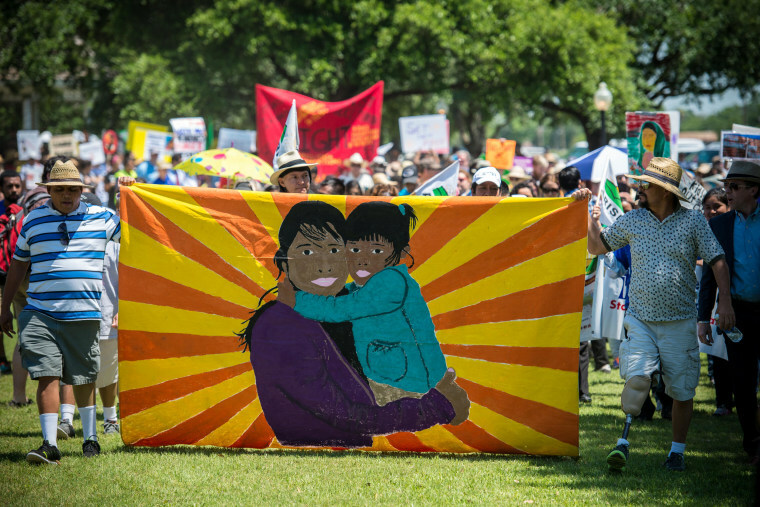 "There are such profound similarities in the rhetoric used to criminalize these communities and even the location of the detention camps in rural south Texas. Frances Kai-Hwa Wang is a freelance writer and speaker based in Michigan and Hawaii. She has been a contributor for AAPIVoices.com, NewAmericaMedia.org, ChicagoIsTheWorld.org, PacificCitizen.org, InCultureParent.com. She has published three chapbooks of prose poetry and been included in several journals, anthologies, and art exhibitions. She teaches Asian Pacific American Studies and writing, and she speaks nationally on Asian Pacific American issues.